When it comes to high-end hot rods, serious Pro Touring musclecars, and some of the raddest rides around, Kindig-It Design in Salt Lake City, Utah, ranks among the top builders. But this feature isn’t about the amazing cars and trucks that come out of the Utah shop, nor is it about the company’s founder, head honcho, and current television star of the hit Velocity show Bitchin’ Rides. No, this feature is about the woman that does it all for Kindig-It. Whether it’s behind the scenes or in plain view, co-founder of the acclaimed business, wife of Dave Kindig, and mother of the two, Charity Kindig is the glue holding everything together. Oh, and did we mention she’s a die-hard car girl too? Well, we figured that was a given. A star in her own right, Charity has been interested in cars since she was a little girl. With a father who was a hot rodder and car club member, and a mother who was certainly a fan of classic cars herself, Charity grew up knowing all about the hot rodder passion. Before she could drive on her own, it was going to car shows and cruise-ins with her parents that Charity enjoyed, telling us she fondly remembers dropping pebbles and pennies through the floorboard of her mother’s ’55 Bel Air during her childhood. When it was time for Charity to get her license, it was another Chevy that made an influence in her life – this time it was a 1967 Chevelle that her dad bought her for her as her first car. With the coolest car in the high school parking lot, Charity and her friends enjoyed cruising State Street in the Chevelle, and frequenting dance clubs. It was at one of these clubs that she met the love of her life, Dave Kindig. Charity held on to the Chevelle until her and Dave were getting married, trading the car for something more fuel efficient. To replace it, Dave bought her a ’62 VW Bug that she tells us, she loved almost as much as she loved her classic musclecar. 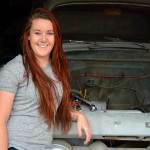 As a young car enthusiast, Charity delved into the automotive hobby on the work front as well, claiming a parts-runner job at a local automotive shop. Once there, she worked her way up the ranks, eventually becoming a manager and overseeing the warehouse. After the aftermarket shop, her next automotive job was as co-owner and impromptu secretary of Kindig-It Design. For years, the thought of opening a custom shop was deeply seeded in Dave Kindig’s mind. He had been working out of the couple’s garage on various projects for family and friends, and wanted to take his passion for building and turn it into a full-time job. Charity was all for it, telling Dave that once their youngest child was born, he could quit his job and build a business of his own. It was just six weeks after the couple’s youngest child, Drew, was born that Dave quit his job, ready for the next adventure. “I was absolutely terrified to take this leap of faith with him,” Charity explained. It may have been a leap of faith nearly 18 years ago, but the choice to start Kindig-It Design couldn’t have turned out better for Charity and Dave Kindig. Kindig-It Design is now one of the premiere custom automotive shops in the country, with nationally-recognized builds coming out of the shop on a yearly basis, appearances at major automotive shows happening year round, including shows like the Goodguys Southwest Nationals and SEMA, and of course most recently, a top-rated TV show on Velocity featuring many of the shop’s builds. Without Charity standing by Dave on his dream so long ago and throughout it all, none of this would have been possible. “It is the most rewarding experience to build a business with your best friend, and the hardest thing I have ever done,” Charity explained. With Kindig-It Design coming up on 18 years in business, Charity has taken her role in the company to great heights. Not only is she co-owner of the company, she’s also the vice president, overseeing just about every part of the company. She also started – and continues to play a part in designing and selling Kindig-It Design apparel, which the couple’s 20-year-old daughter Baylee now oversees. To say that Charity is the backbone that supports, structures, and keeps Kindig-It Design organized and running smoothly on a daily basis would be a harsh understatement. Charity’s dad was a major influence in her life, introducing her to the hot rod world. To this day, he remains a vital part of Charity and Dave’s automotive passion. Undeterred by what some of the “good ole boys” might think about women in the automotive world, Charity told us that her best defense against such stereotyping is her attitude. “A little sass and confidence usually get’s me through most situations,” she explained. Matriarch to the Kindig family as well as the Kindig-It Design crew, Charity has a lot on her plate, but it’s nothing she doesn’t handle with poise, grac,e and a little bit of sass! In case you were wondering, Dave and Charity’s first-born, Baylee, is a diehard car girl herself. She is currently the shop’s executive assistant, having worked her way up from a parts runner for the guys in the shop. The couple’s youngest, Drew, is also a creative soul, although designing cars is less his thing than designing theater sets and dabbling in furniture design. Charity may have her hands full as vice president of Kindig-It Design, and mother and wife, but she still finds time to partake in some of her favorite pastimes like playing golf, decorating, and anything that has to do with creating things. She’s also very passionate about a number of causes, which the Kindig family contributes to regularly, including suicide prevention in children and mental health causes. Charity (pictured here at age 12 with her dad’s Corvette) may have a family and a business of her own these days, but her passion for cars goes back to her roots! An amazing woman, mother, wife, business person, and influence in the automotive world, Charity Kindig is certainly one female that we can all look up to in the car scene. One of a kind without any apologies, we’re thankful to be able to call the woman behind Kindig-It Design’s success our latest Rod Authority Leading Lady!